ECOTHERM ENERGY SYSTEMS is Authorized Distributor for SIEMENS in India for their combustion control/ burner products. Almost all burner products are available with us ready stock. SIEMENS burner controls are used in all over the world by almost all burner manufacturers. Reputed manufacturers like Weishaupt, Elco, Oilon, Unigas, Baltur, Nu-way, Ecoflam, Riello, Bentone, FBR use Siemens controls in their burners. 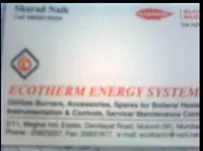 ECOTHERM ENERGY SYSTEMS is one of the biggest importer and stockiest of other burner products like, Fluidics Nozzles, Suntec oil pumps, Honeywell burner products, Parker / Lucifer oil solenoid valves, Kromschroder gas products, Giuliani Anello products. We have grown in a stature as an organization under the able guidance of our owner Mr. Sharad Naik. Owing to his goal oriented approach and his sharp business acumen, we have been able to take giant strides in the market. Our products and services can be customized as per the requirements of our esteemed clients. Within a short span of time, we have set our strong foothold in providing an assortment of reliable installation, erection, and commissioning services for Oil, Gas, Duel Fuel Burners and gas control stations. Our expertise also allows us to undertake maintenance of Boilers; Thermic fluid heaters & Hot water Generators; Hot air Generators and Furnaces. By undertaking various challenging projects of our clients, we have been able to serve the needs of chemical industry, food industry, hotel industry, textile industry, quarrying, paper / wood processing, metal industry, automobile industry, agriculture, waste management and leather industry. We employ quality proven methodologies in our work procedures, which allow us to undertake and accomplish our work with utmost precision. With the identification of new opportunities for improvement, we have been improvising our services from time to time to cater to the requirements of diverse industries in the best possible ways. Best products in the market meant to provide maximum utility to the end user.